Oh, yes, indeed it does! I have been talking about scale in recent posts, and those thoughts continue here. Change channels if you are bored. I will forgive you. Eventually. When searching for hours and hours and hours, well on into days and weeks and months, for items in proper 1:6 scale with which to create my miniatures in the OSS Etsy Store, it becomes abundantly clear that such items do not exist in most cases and in other cases, they exist in minute quantities and with extremely limited availability. It will not come as a big surprise to most of you reading this that most miniature supplies come from Asia by way of Ebay and Etsy. And most of said supplies are in the smaller 1:12 or dollhouse scale. In some instances, those items can cross over to the larger 1:6 scale, but not always. That’s where the “wiggle room” I spoke of earlier comes into play. I often must purchase something and hope it will work. Occasionally, it does. More often, it does not. Size matters. Oh, yes, indeed it does. This is why I created a set of minis in 1:12 scale as well as a set in 1:6 scale. I do not often work in the smaller dollhouse scale, but when the dishes demand it, I must comply. 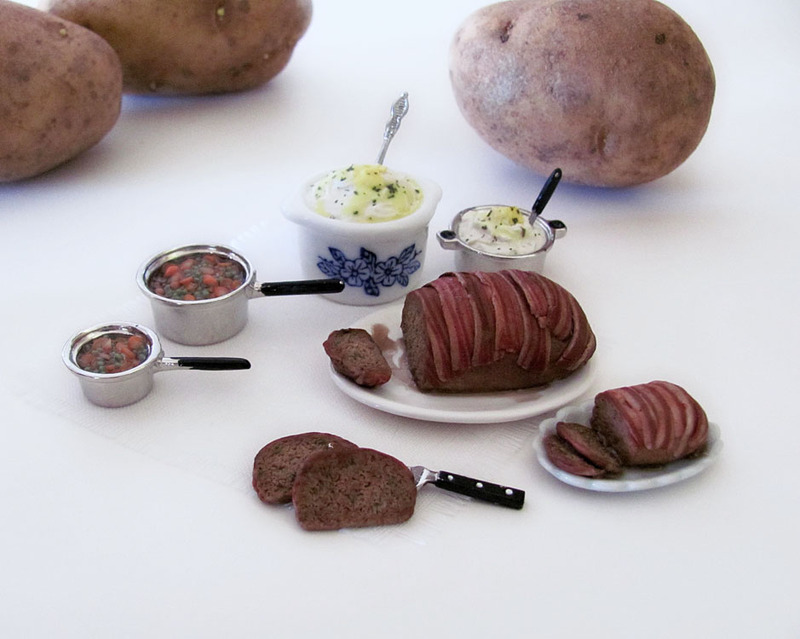 Both Bacon Wrapped Meatloaf Sets can be found, at this publishing, in the OSS Etsy Store. Enjoy!